Augusta, GA – Eris Kitchings Wertz Rayfield, 95, entered into rest on Monday, April 1, 2019 at Kentwood Nursing Center. Funeral services will be held from the chapel of Chance & Hydrick Funeral Directors this Thursday, April 4, 2019 at 11:00 A.M. with Pastor Barry Clanton officiating. 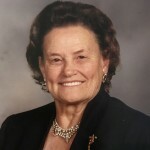 Interment will follow in the Poole Family Cemetery, Salley, SC at 2:30 P.M.
Mrs. Rayfield was a native of Aiken County and the daughter of the late Dolphus Preston and Lillian Sanders Poole. She had made Augusta her home for most of her life, had owned her own Professional Business Schools. Worked at S.R.S, and also retired from Bi-Lo. She was a member of Christway Christian Church. She was preceded in death by her husbands, Leslie E. Kitchings, Sr., Claude Wertz and Carl Rayfield; her sons, E.P. Kitchings, John Kitchings and Les Kitchings. Survivors include her step son, Leonard Kitchings (Myra); her daughter-in-law, Joanne Kitchings; as well a being blessed with a host of other step-children, grandchildren, great grandchildren and great great grandchildren. If desired, the family requests in lieu of flowers, to plant a tree or rose bush in Mrs. Rayfield’s memory. The family will receive friends on Wednesday from 6:00 until 8:00 P.M. at the funeral home.